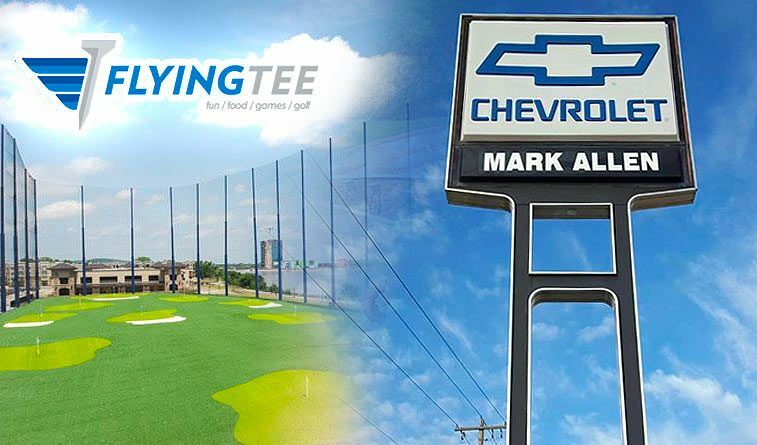 TULSA, OK (12/5/18) FlyingTee is excited to welcome Mark Allen Chevrolet as an exclusive sponsor of one of the third-floor suites. The dual-hitting bay area is completely upgraded, to provide an even more comfortable environment to enjoy FlyingTee’s unique experience. The Mark Allen Chevrolet Suite is open to more than the family and dealership team. All FlyingTee patrons can reserve this newly decked out suite, through the online reservation system or schedule a private event in the Suite for your next company or social event need. Mark Allen Chevrolet is the newest Chevy Dealer in the Tulsa Metro. https://www.tulsadrivesmarkallen.com/ A partner of the Classic Chevrolet of Grapevine, Texas store, Mark Allen moved to Tulsa with his family, and committed to providing the same great selection, service, and laid back customer experience that folks in the Dallas Metro have come to expect. Mark Allen Chevrolet located in Glenpool, 16837 S. Hwy 75. Additional suites are available for corporate sponsorship. Contact Dionicia McCallum, Director of Marketing, for more information.